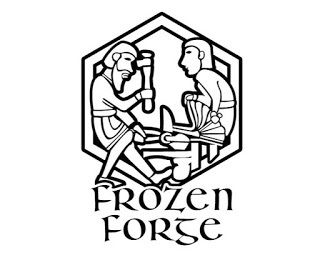 I just bought a ticket for BonesCon (previously SmogCon), I hope I can get more Norwegians to join the fun! Hi! 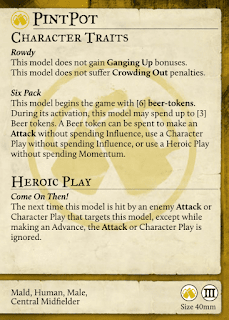 Welcome to my Brewers guide. If you see any mistakes or missing tactics, please let me know! Mash, Scum, Quaff, PintPot, Stoker, Harry "The Hat", Hooper, Hemlocke. 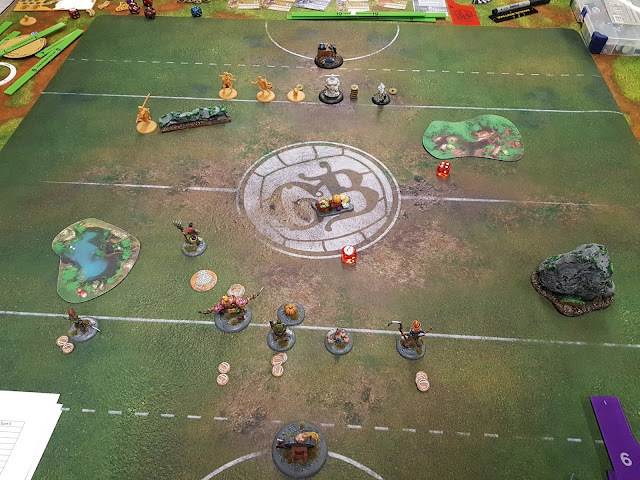 Kick Off set match report, which explains a lot of the interesting Brewer interactions. 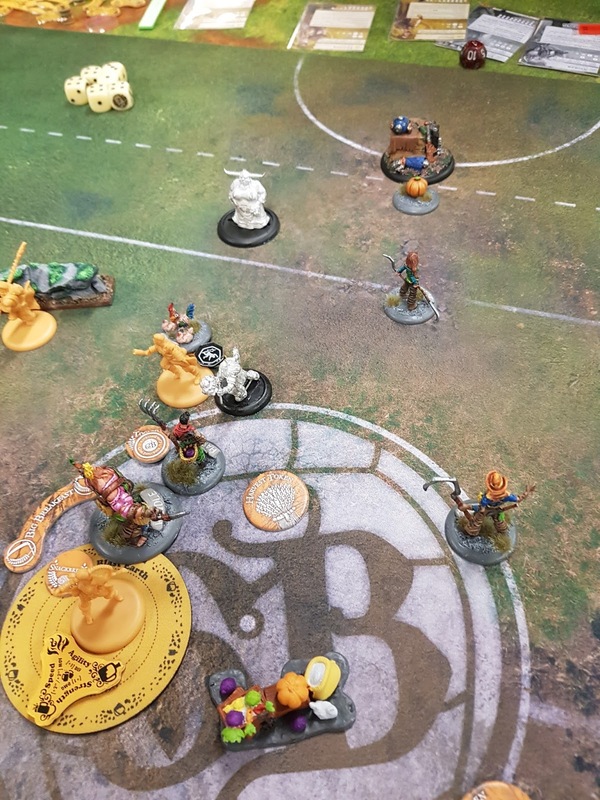 A great place to start if you don't know anything about Guild Ball or the Brewers! Excellent article about how to choose your roster, from Midwest Wargaming. You have two choices here, Tapper is a melee brawler, and Esters is better at playing football and the ranged game. Tapper is excellent at brawling due to his Commanding Aura, and he is pretty hard to take out due to Tough Hide. 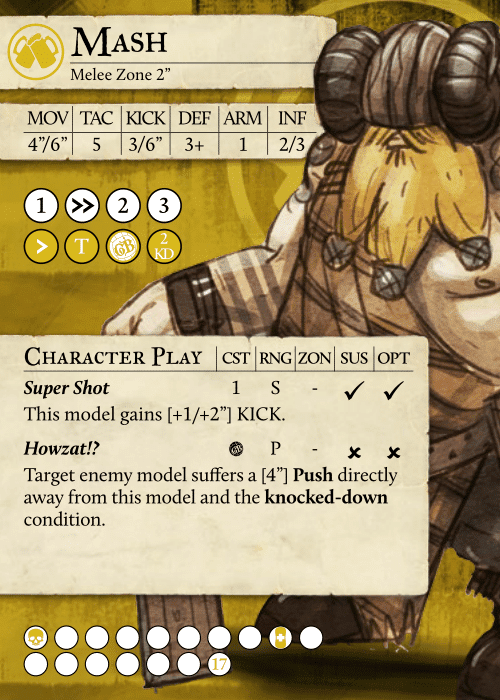 Tapper is vulnerable to heavy control teams, due to the Brewer's lack of speed buffs and Dodges. Tapper usually wants to activate early, since his Commanding Aura is extremely strong. He should build momentum to give away the 2 extra influence from Old Jake's. 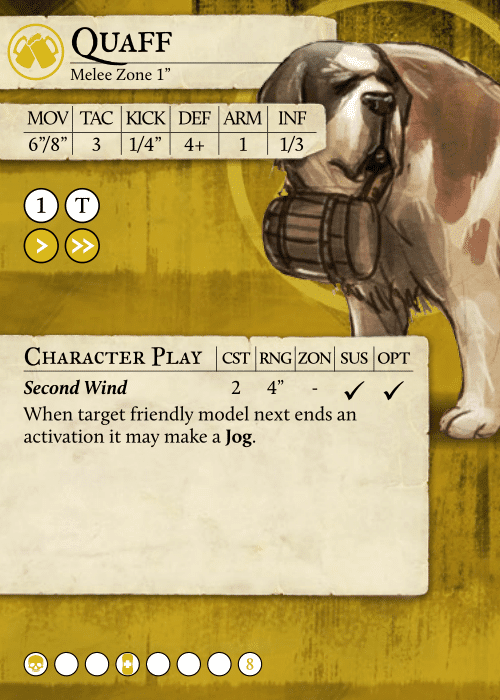 His momentous KD column is very easy to get off, and useful to activate the damage buffs on Hooper and Spigot. If Tapper cannot reach his target, he can still run, put up the Commanding Aura, and use Mark Target to make someone else get in. Esters is better at control, football, and the ranged game than Tapper. Esters can be a good kicker against teams that can Mind Control (or similar abilities), since she cancels the first Character Play with her Gluttonous Mass. 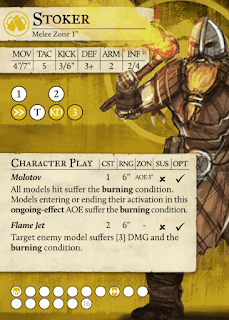 Friday can be buffed to unkillable stats with Esters and Spigot (6+ defense, 1 armor). 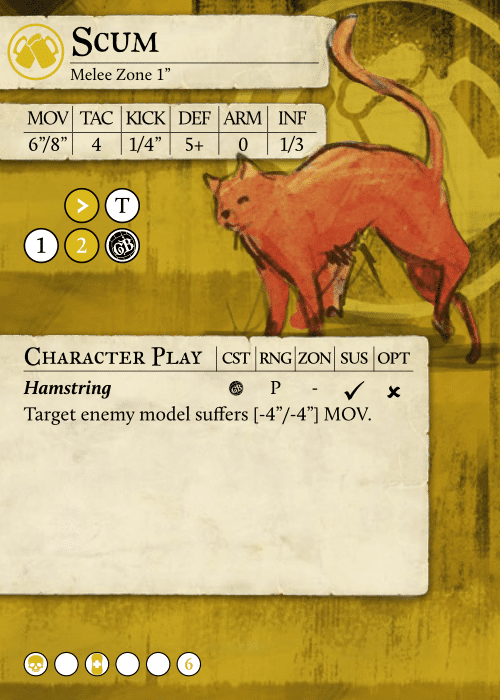 Scum the murdercat, or Quaff the docile dog. 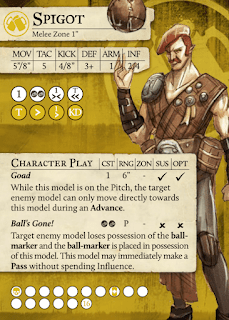 Scum is good for holding the ball against teams that can Mind Control (or similar abilities). Since he has only 1/4" Kick he has a great chance of missing, and he cannot kick very far. Some models with these abilities are Obulus (Morticians) and Siren (Fishermen). Scum has a long threat range and can definitely score goals. 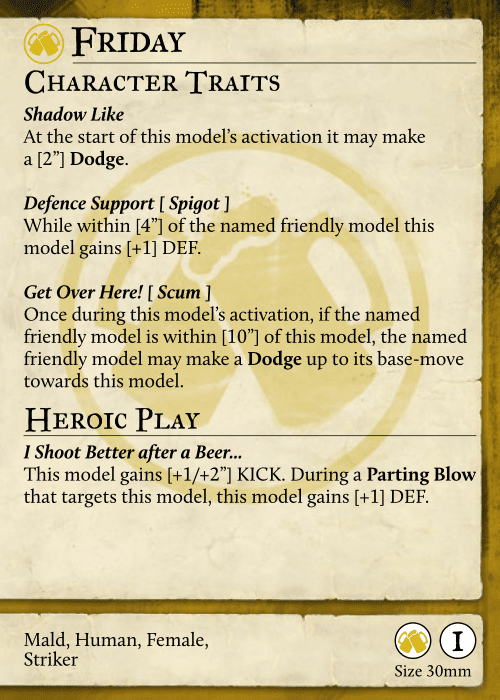 A simple combo is 6" Dodge from Friday + Shadow Like + 8" Run = 16" movement with a 20" goal threat. A Bonus Timed tap in has an 89% chance to score, with 2 dice on 3+. Scum can also do surprise pushes so that enemy players get into range of your beaters. Double momentous double push requires only 5 hits, and that is not impossible on a charge. 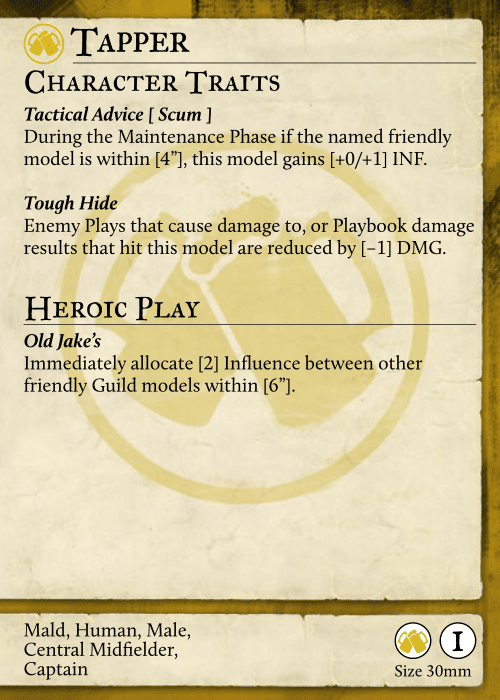 Scum is one of the best damage dealers in Brewers. A very short playbook + Tooled Up, Commanding Aura, or Esters buff can make the cat deal 4 damage per wrap. 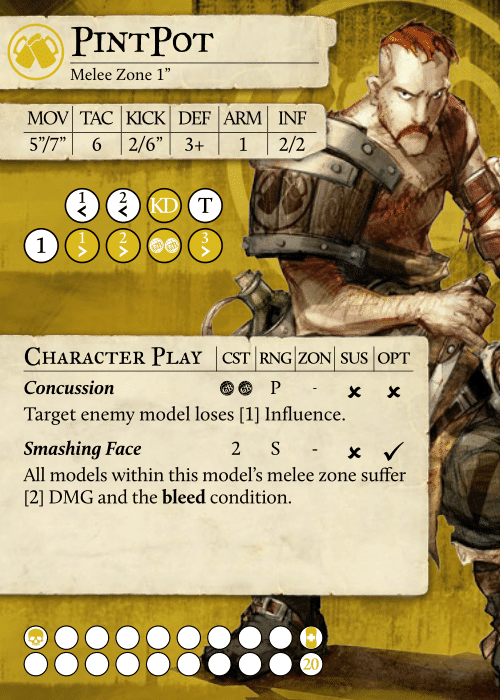 The Sic'Em Plot Card is very strong with Scum, you can do 20+ damage in one activation against low defense targets. Quaff is a dog. Who in their right mind would pick a dog over a cat? The Brewers have a good selection of damage dealers and football players, but few control pieces. Friday is great for kicking and receiving against teams that have ranged character plays. 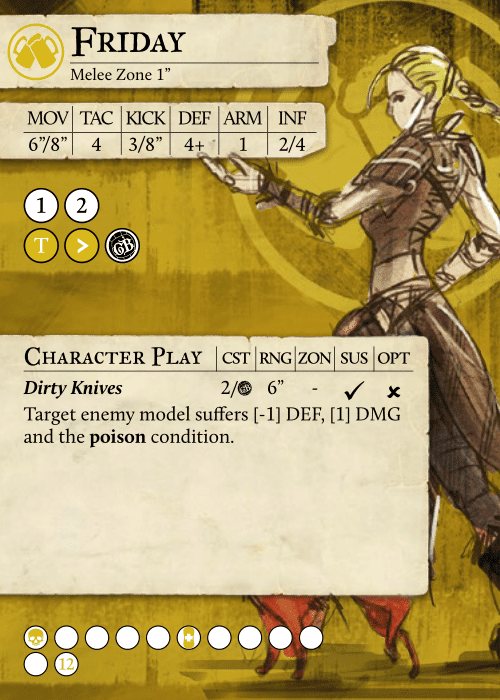 With Esters' and Spigot's bonuses she will be defense 6, and pretty difficult to land Character Plays on. 5+ defense (within 4" of Spigot) and 1 armor are among the best defensive stats in the game. With these stats and a column 1 T she is pretty hard to get the ball off. Hooper has insane damage output. True Grit gives him 7 TAC, which is already high enough to start wrapping against low defence targets. 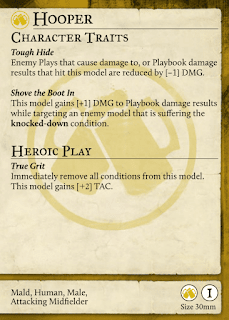 With Commanding Aura, Tooled Up, and Shove The Boot In, he is at 8 TAC and +3 damage against KD models. 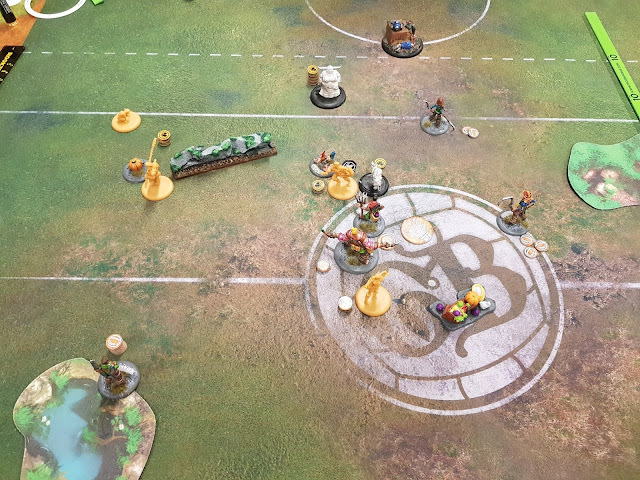 Three attacks from a fully buffed Hooper can take out most unhurt players. 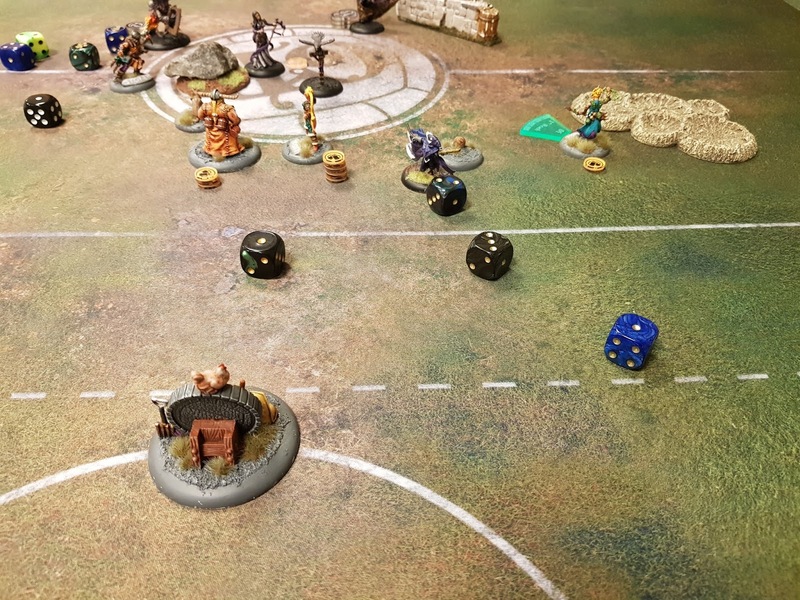 Hooper is also one of the few 2" melee models in Brewers, which can be important against Unpredictable Movement players like Greyscales, Mash and Midas. Mash has 2" melee and Unpredictable Movement, and his counter-attacks give a 4" Push and knocked-down with Howzat!?.. This makes him annoying to pin down and an excellent ball killer (model that prevents the opponent from getting the ball and scoring). 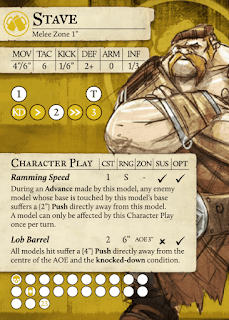 While the miniature makes Bash look like a tough guy, he is not nearly as punchy or tanky as Tapper and Hooper. His role is to be an annoyance, ball killer, and snap shot threat. Use him against teams that want to make 2 or 3 goals to win! PintPot's advantage is extreme influence efficiency. 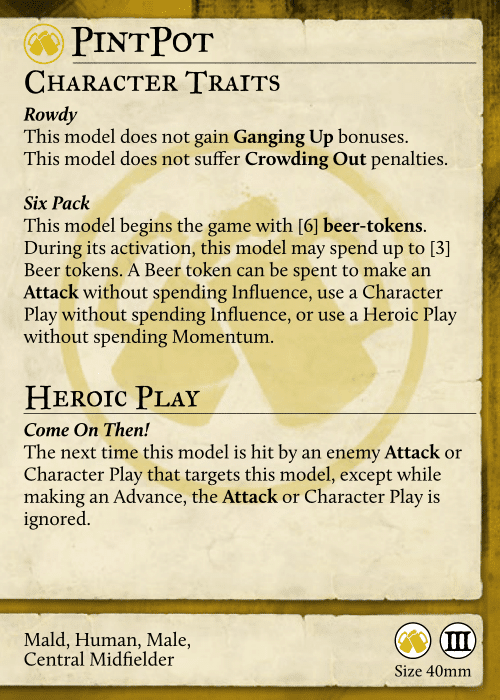 With 6 free actions during the game from Six Pack, he can often do his job on 0 influence. 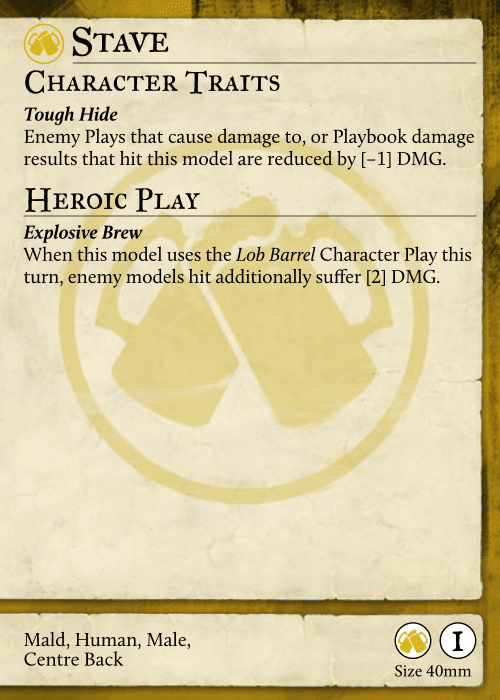 Jog up, drink a bottle, autohit everyone in melee for 2 damage + bleed, drink another and activate Come On Then! Hitting a model that was going to do something important with a momentous Concussion can interfere with the opponent's plans, and also rob them of opportunities to their own momentum themselves with the lost influence. 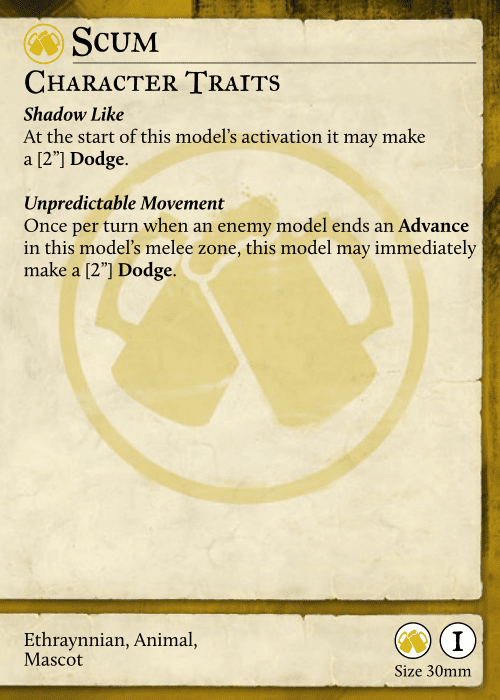 Berserk players like Windle are perfect targets for influence removal. Not that Rowdy just affects PintPot when he is attacking. Ganging up and Crowding Out still work against PintPot when others are attacking him, so if you run him alone into a bunch of Butchers or Farmers, expect to get beaten up in return. PintPot can ignore a Character Play with Come On Then! which makes him a great model to send in front of the others against players like Corsair and Siren than can pull in your models. 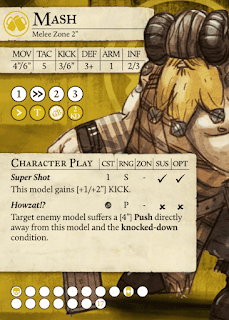 Spigot buffs movement, damage, and football, so he is a very useful all-round player. Just with the abilities on his own card he has a 17" goal threat. Spigot can put out both his buffs (Time's Called and Tooled Up) with just 1 influence allocated and 1 momentum, so he can very pretty efficient. 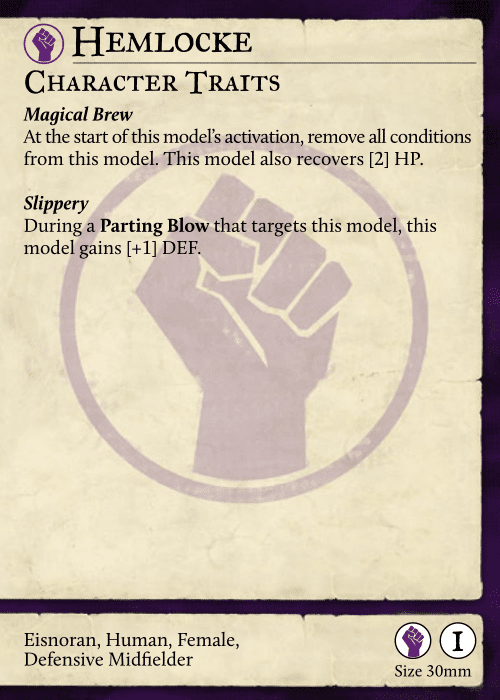 Spigot is one of the least solid Brewer players. 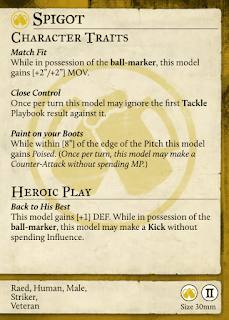 He has no defensive abilities outside of getting 3 hits on a counter-attack, which is not something to count on. Usually you would prefer to keep him behind your other players until it is time to commit him against a KD enemy player. 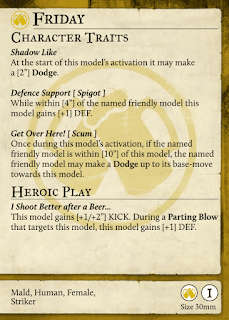 Veteran Spigot is purely a striker. 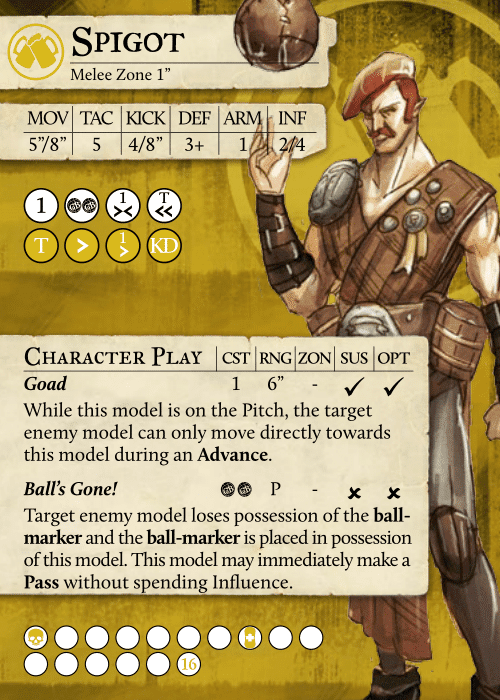 He does not have any of Spigot's team buffs, so he seems interesting in a completely football focused lineup. 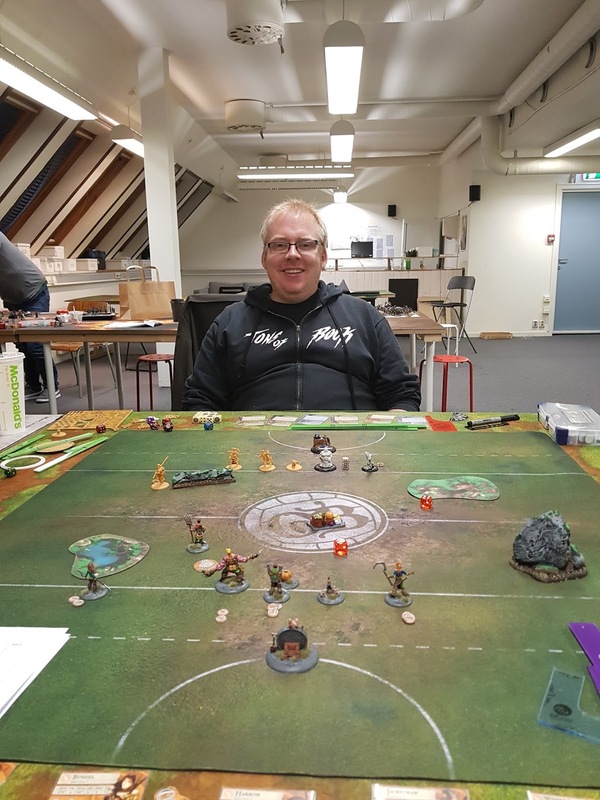 The greatest challenge with Veteran Spigot is that he cannot be played together with normal Spigot, so you are losing your best all-round player and access to Tooled Up and Time's Called. Stave is great against slow melee opponents, like Windle (Farmers). He is less good against more mobile and spread out opponents. 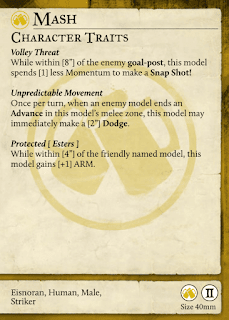 Weaknesses: Stave is a momentum piñata for the opposing team, and is the best possible target for enemy strikers to bounce off. It is a often good idea to try to keep him out of mêlée combat. 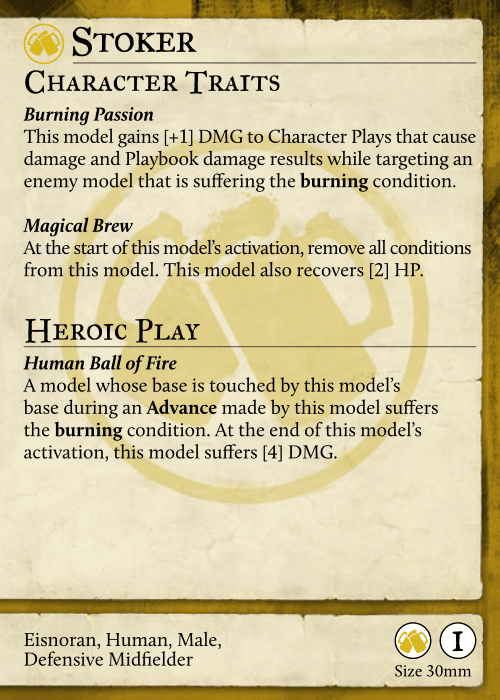 You can trigger Burning Passion by either throwing a Molotov or using Human Ball of Fire. 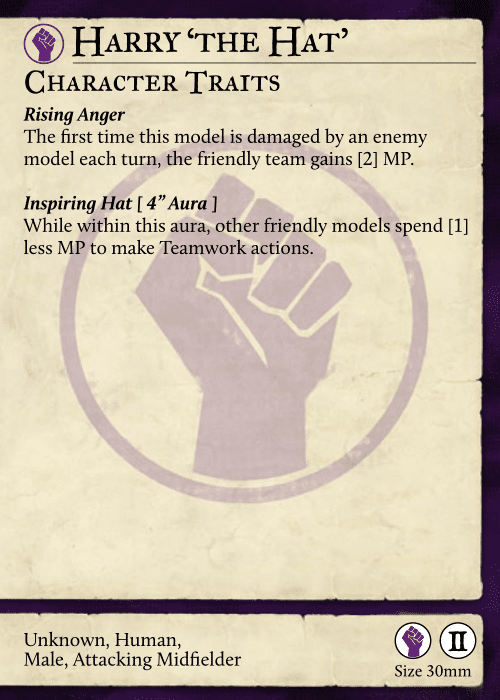 Esters or Harry "The Hat" can also trigger it. 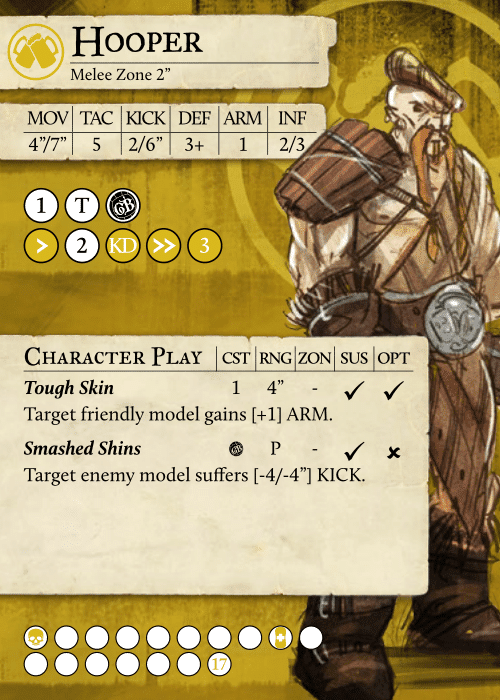 Stoker is pretty tanky with his 3+/2 defensive stats, automatic condition removal and regeneration. He is a good pick against condition damage teams. 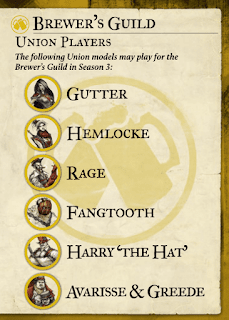 The two most interesting Union choices for Brewers are Harry "The Hat" and Hemlocke. 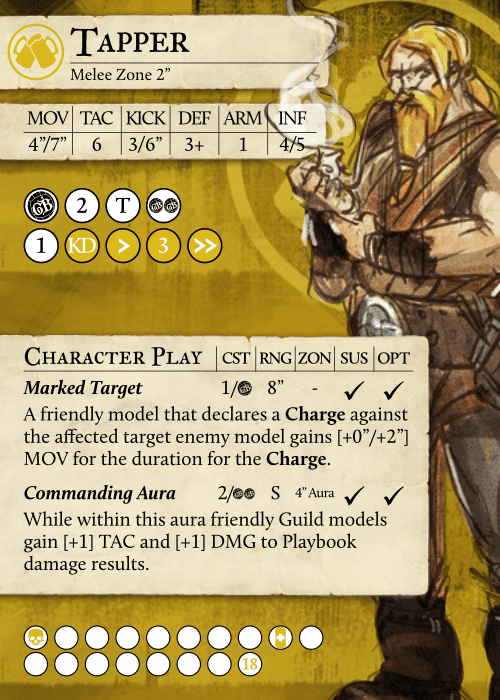 Damage dealing Union players don't benefit from all the in-faction Brewers buffs like Commanding Aura and Tooled Up. 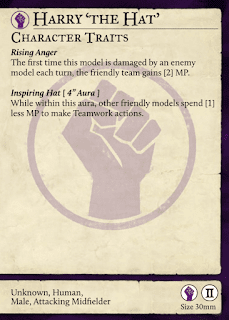 It is therefore usually better to use in-faction players as brawlers. Harry is no longer a great brawler after the nerfs, but he is still great at setting up plays. He allows the team to dodge forward while building momentum, and his double pushes can be good for pulling an enemy player in and beat him up. 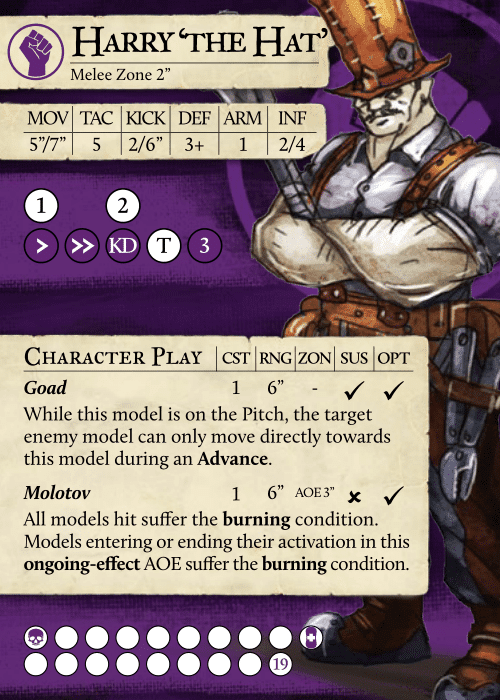 An extra Molotov helps set up Stoker's damage buff. 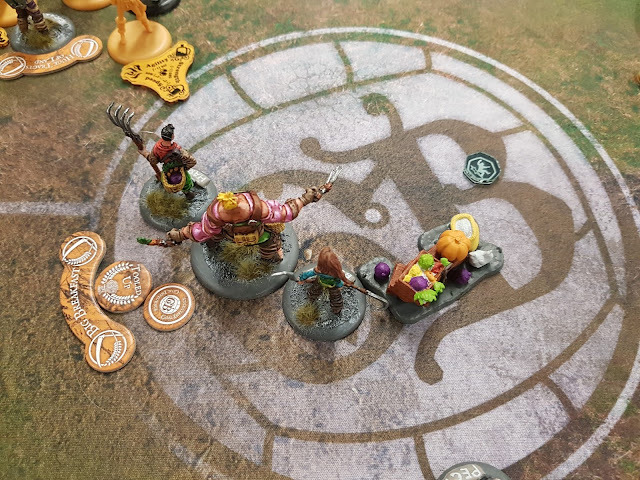 Goad can really screw up for your opponent. 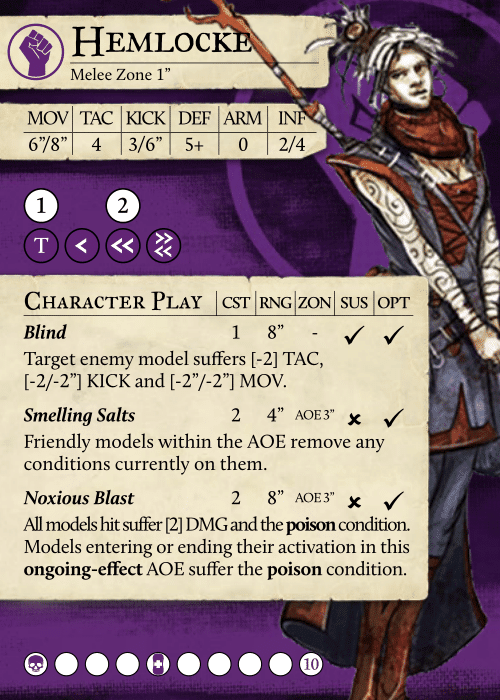 Hemlocke is a good pick against teams that do a lot of condition damage. Smelling Salts can cure herself and the team, and Magical Brew heals herself. 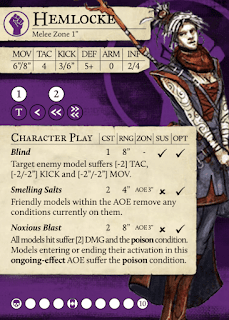 Going last can be good against Smoke, it allows Hemlocke to clear conditions after Smoke does all her AOE duplication and movement shenanigans. There is some overlap between Esters' Soothing Voice and Hemlocke's Smelling Salts. This makes Hemlocke a bit less useful with Esters. Blind is very powerful both against strong melee opponents and against strikers. 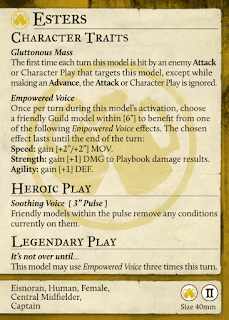 Allocating 1 influence for Blind can force the opponent to activate likely Blind targets first. It's usually a good idea to Bonus Time important Blinds. 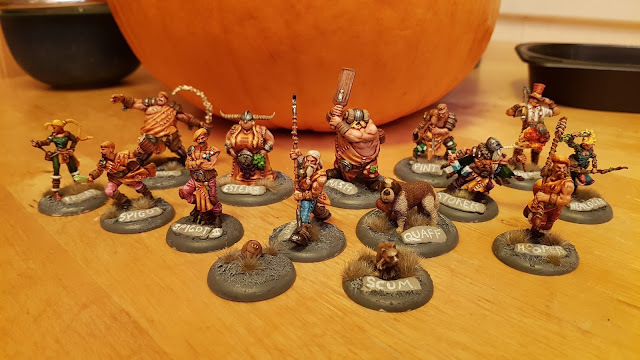 Tapper, Scum, Friday, Hooper, Spigot + tech choice. I requested a match against Morticians, since I have only one game so far, and they seems pretty tricksy! I decide to try out some of my new Brewers, and see how a 100% shooty list works. I take Esters, Spigot for Tooled Up, all the shooty models (Friday, Hemlocke and Stoker), and Scum. I move Spigot up, do a greedy kick, and it fails. The ball is given to Graves. 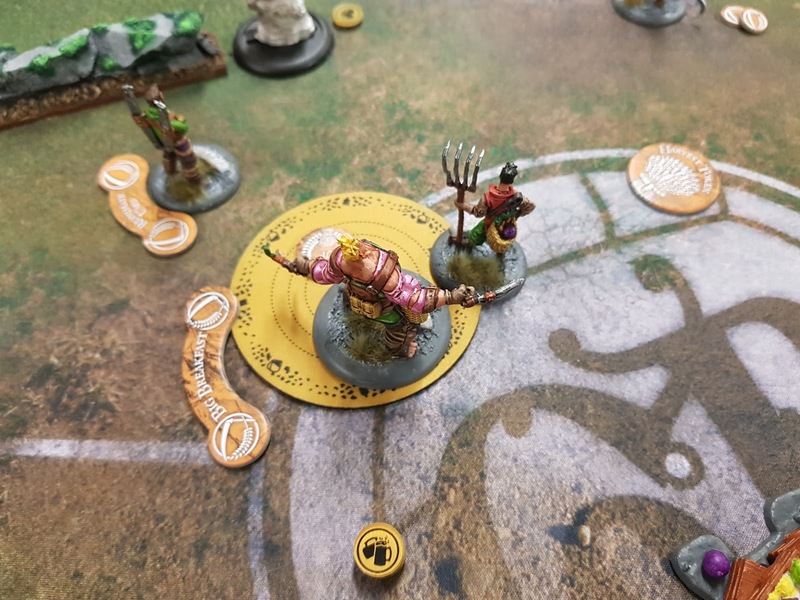 Obulus Mind Controls Spigot and makes him run forward. He activates and runs back. 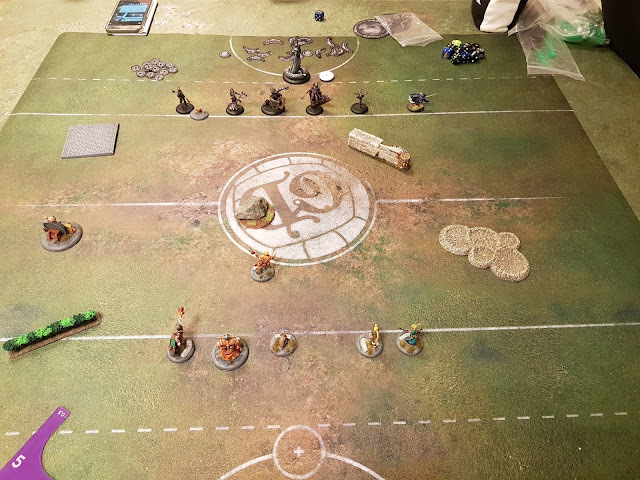 Cosset moves up and Lures him forward again, setting him up for Mist. The ball is kicked over to Mist. 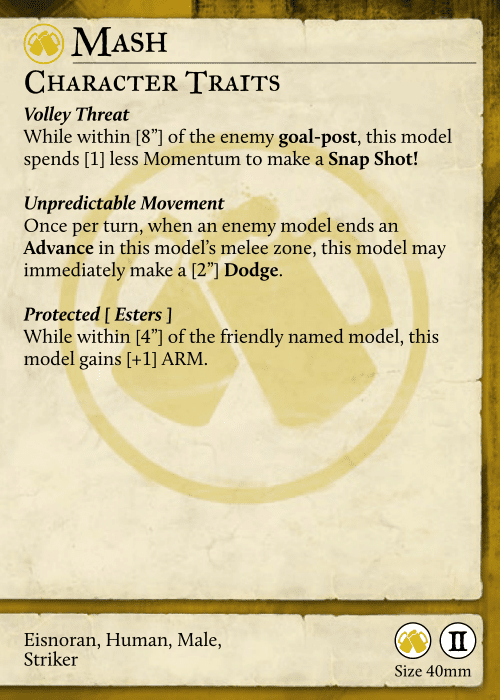 Ester damage buffs herselfs. I then take out Dirge with Esters (having zero momentum at that point). The score ends up 3-2, which is just dumb luck. 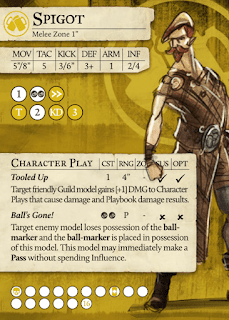 Spigot grabs the ball. 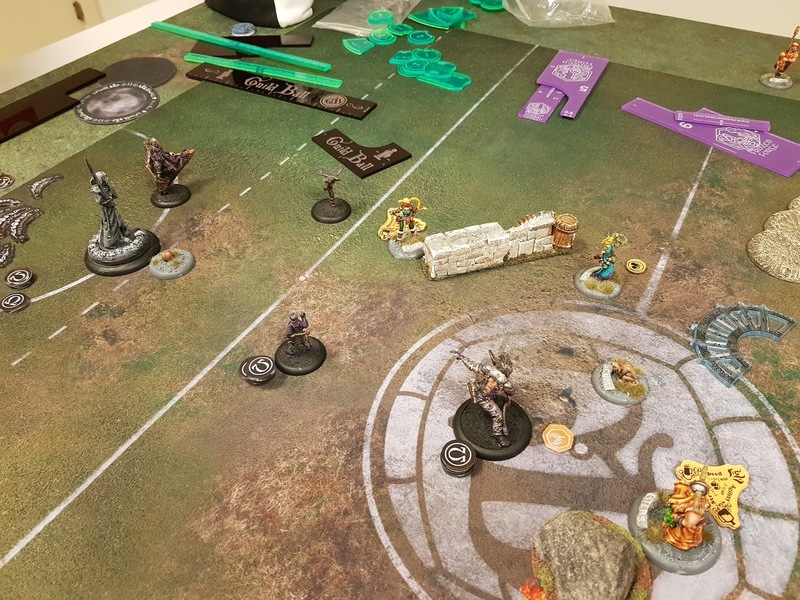 Mist goes forward and takes the ball of Spigot, and taps it in. The goal kick then goes out near Friday, who is able to just run, pick it up, and punt it into the goal. I also take out Cosset in retaliation. The score is now 9-6. 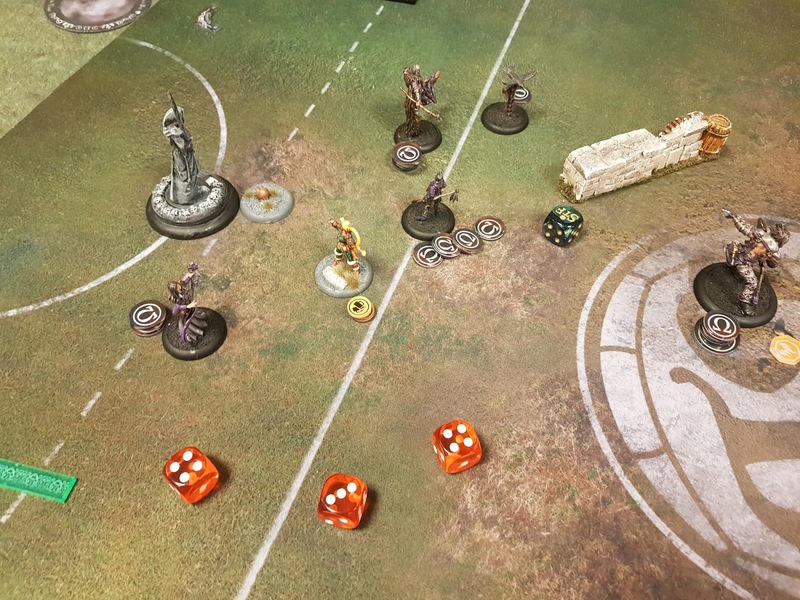 Morticians make a very short punt out from the goal, leaving it well withing Friday's goal threat range. Hemlock is attacked by Ghast and pushed forward. I declare a counter-attack, which is silly, since she has too short melee rage. She does a clutch Blind on Graves and rolls a 6. This makes it harder for him to take out Friday. 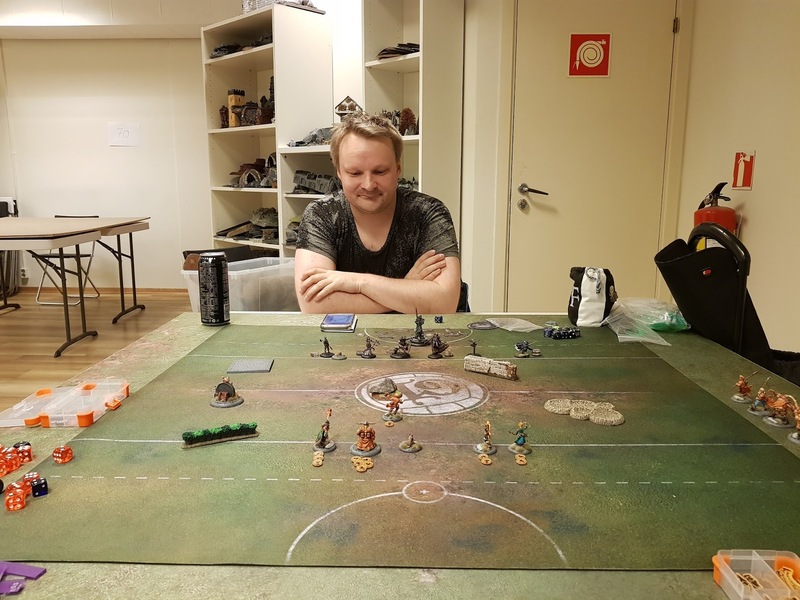 Graves attacks Friday, but Stig forgets that he has Bleed and +1 damage from Tooled Up. 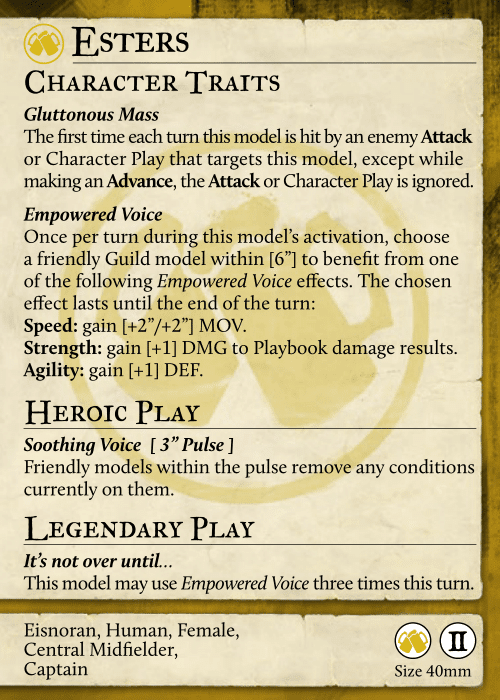 We find this out later in the turn. I offer to remove Friday, but Stig refuses. She stays on the board. 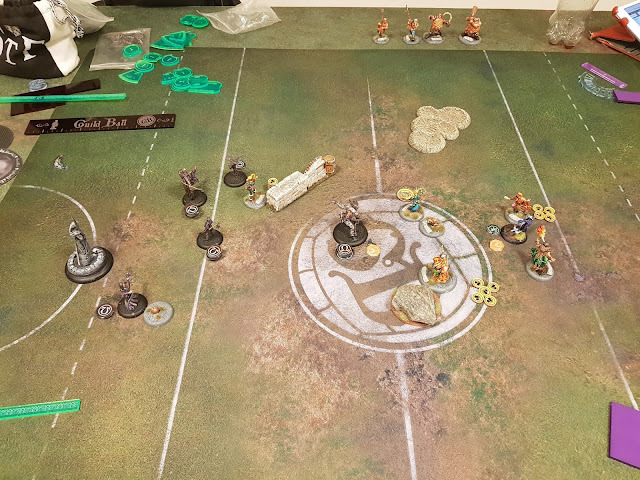 I can either go for Friday kicking the ball in, or kill Dirge and then pile up on Ghast. Friday dodges, circles around Graves, tackles Cosset, gives Cosset a momentous push, Cosset attacks back, dodges out of Friday's melee range. Friday Bonus Times and taps the ball in. 12-6 to the Brewers! 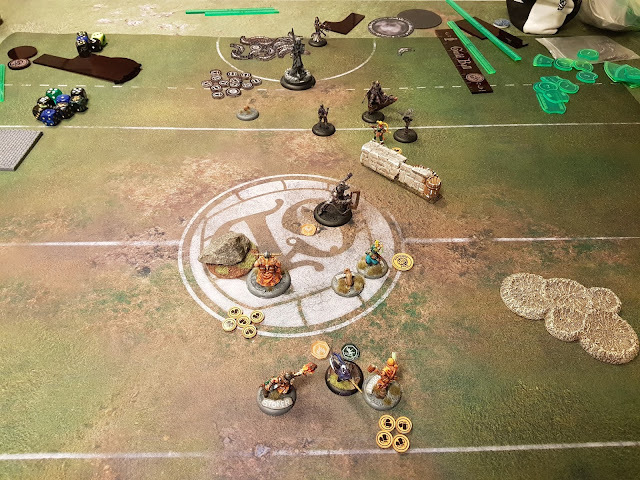 Against the Morticians I think it makes sense to kick with my highest defense model, to make it harder to pull off stuff like pulling in Spigot and bouncing off him. It would also be good to be able to keep the kicker within reach of someone with an easy knockdown. I should probably try to avoid having one player far forward, it makes it easier for the Morticians drag that player in without over-extending. Hemlocke seems like a bad pick with Esters. I have too little influence to power everything. All the shooting is Esters 4, Friday 4, Stoker 3, Hemlocke 2 (and +1 for Blind) and Spigot 1. This is already at least 1 more than the 13 I have - and it's also quite possible someone needs to run as well! 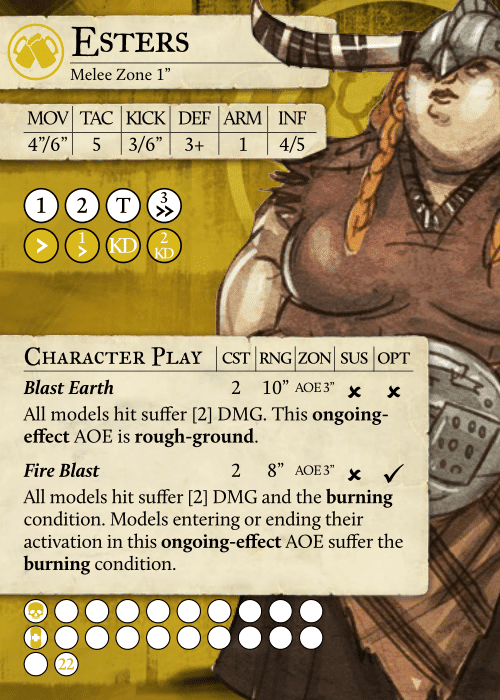 Both Esters and Hemlocke have AOE condition removal, and duplicate toolbox abilities is often wasted. Next time I will probably take Hooper or PintPot for more melee damage and momentum potential. Overall, I think Hemlocke makes more sense with Tapper. It's quite possible I'll keep her in the roster. I really missed Tapper. It was a lot harder to build momentum with this list. I get a better first turn, but it seemed like all the other turns were worse. 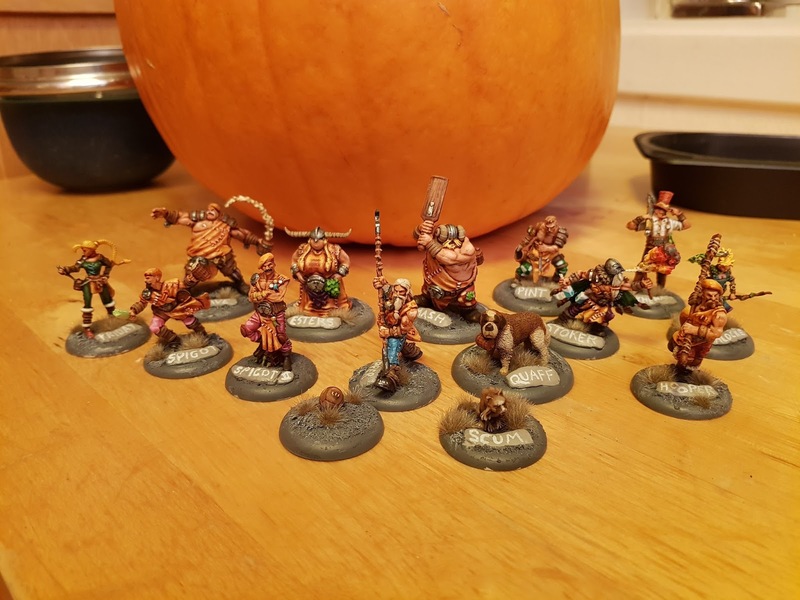 My Guild Ball Brewers, fully painted, plus Union members Hemlock and Harry "The Hat" Hallahan! I went for a bright, high contrast color scheme where I repeated the "tartan" (which I simply painted a bright orange-yellow instead of as a tartan pattern) on every model, and used a palette of various browns for most of the belts, gloves, boots and other details. For contrast and variety, I gave each model a unique piece of clothing, like the checkerboard pants on Mash and PintPot, the bright blue pants on Tapper, or the striped pants on Stave. I hope this makes them look like a cohesive team, but with each model also looking like an individual player. Pretty much all of the painting is bright base colors, a bunch of different GW magic washes, and then picking out highlights and detail. Feel free to ask if you want to know about any particular colors. I find writing names on the rim of the base a bit ugly, so I added a green stuff plate which I built into the base, with the name of the character. 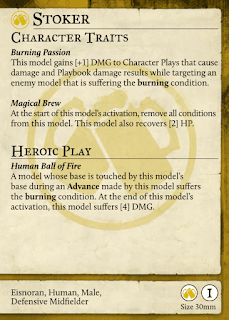 I know from WARMACHINE how confusing it can be with 100+ different models in the game. Hopefully this will make it easier for beginners! 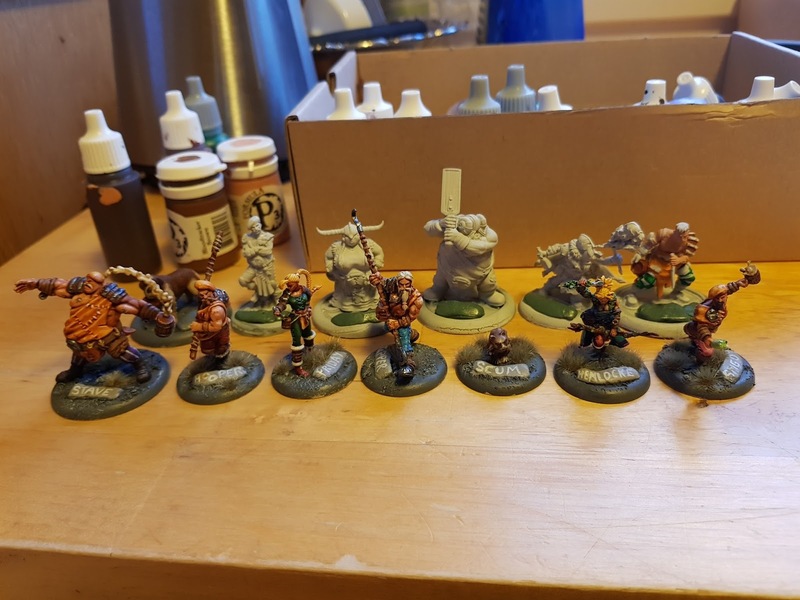 I don't like my bases to take focus away from the miniatures, and I also find basing mind-numbingly boring, so they are quite simple - GW Astrogranite smeared on, with a light grey drybrush, and a few pieces of GW grass tufts. The plan was to make something that will look good, and fairly neutral, on both street and grass mats. I had bought a ticket to Clogcon half a year ago, and since I've been having a break from playing WARMACHINE I was considering not going. It turns out they also have a Guild Ball tournament! So, I am going, and I have swapped from going to the Masters to playing Guild Ball instead. 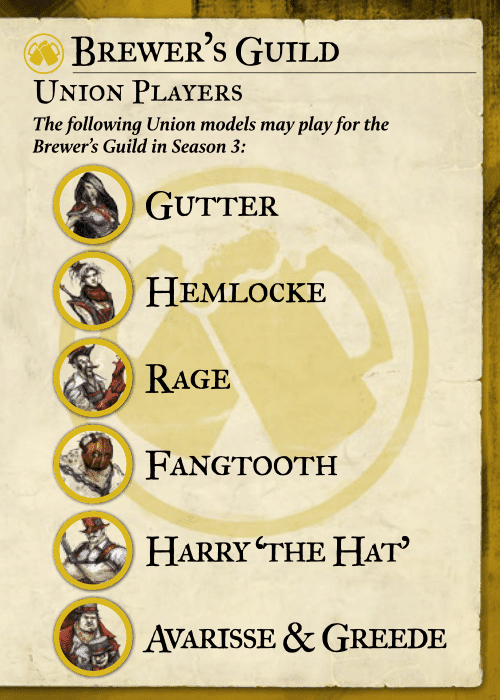 I am going to be playing Brewers, not out of any grand strategic meta considerations, but because it's the team I have played the most so far, I enjoy them, and I now have all the miniatures (sans Lucky and some Union picks). I am currently considering the following players. Tapper, Scum, Friday, Hooper, Spigot, PintPot. 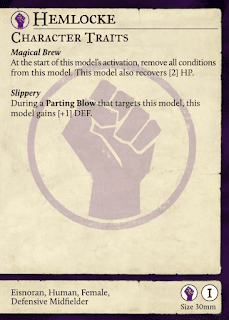 Against slow melee teams, swap PintPot for Stave. Against condition based lists, swap PintPot for Hemlocke. This is pretty much the same as the Kick Off box, and it is what I have been playing so far. 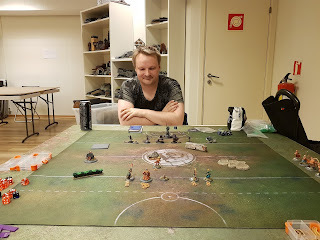 Sinec I haven't been playing long, I think it's a good idea to bring a team that I have played a lot! Esters, Scum, Friday, Spigot, Stoker, Hemlocke. Thanks to Russ Charles for the second team list here. I have not tried it yet, but it sounds very different and interesting! It has lots of ranged attacks and Tooled Up, and can also play some football with Friday and Spigot. 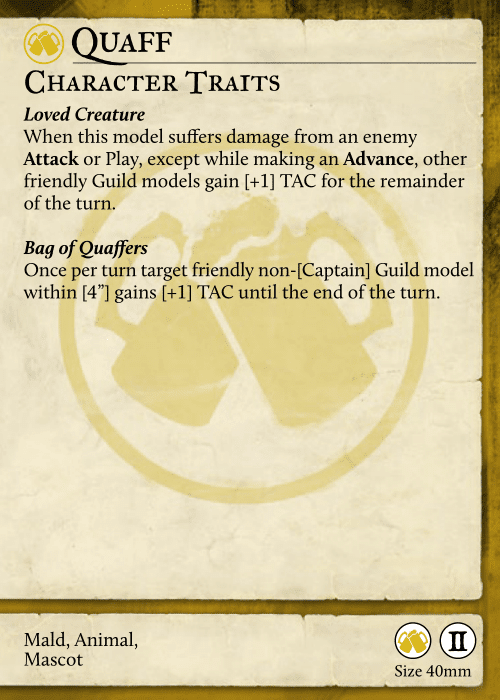 I haven't even played with some of these models yet, so the next step is to paint the models, get more matches in and try them out. 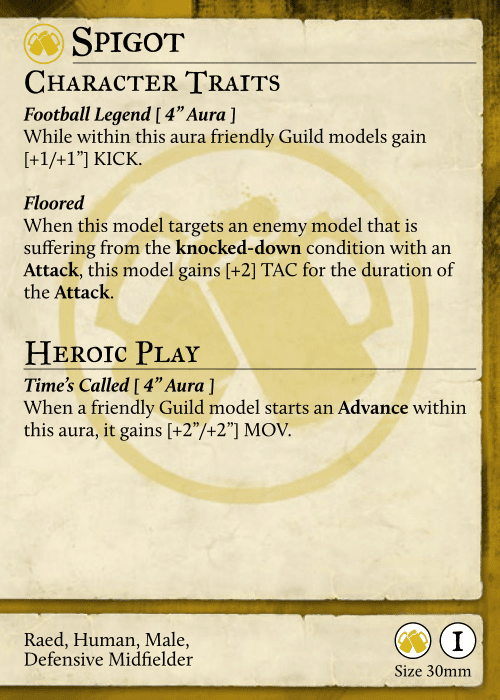 I need to get games against all the guilds, so I at least know what the models do. I have yet to even play a game against Butchers, Fishermen, and Hunters! I have not played much with the plot cards. 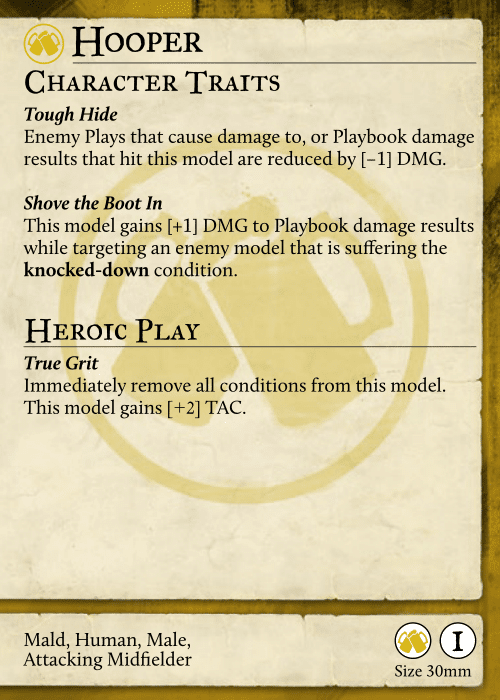 I need to start using them in every game. Every game must be on the clock from now on! 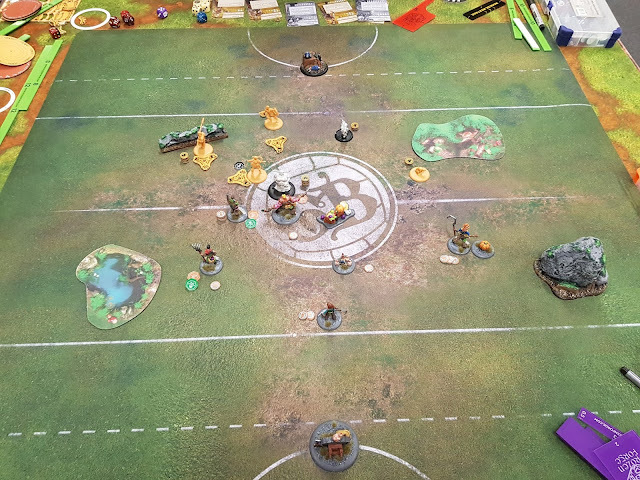 This time I face a different Brewers team, using lots of ranged attacks to fire away at my Farmers. Lars is piloting the Brewers. Guess which models. Come on, just guess. I dare you. OK. I'll say it. 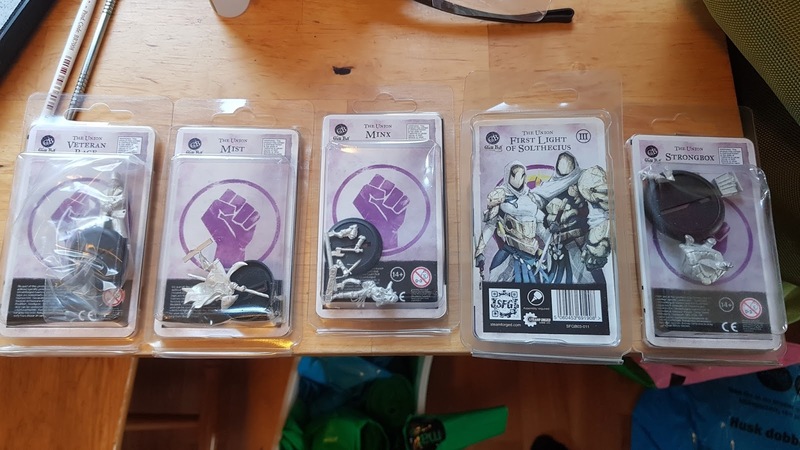 It's the base set. Happy now? Harrow grabs the ball and kicks it over to Grange. I give Grange and Jackstraw 3 each, and Harrow, Windle and Bushel 2 each. I don't expect much to be able to reach him so it's mostly for running and kicking. Tooled Up Esters rains fire on my guys. 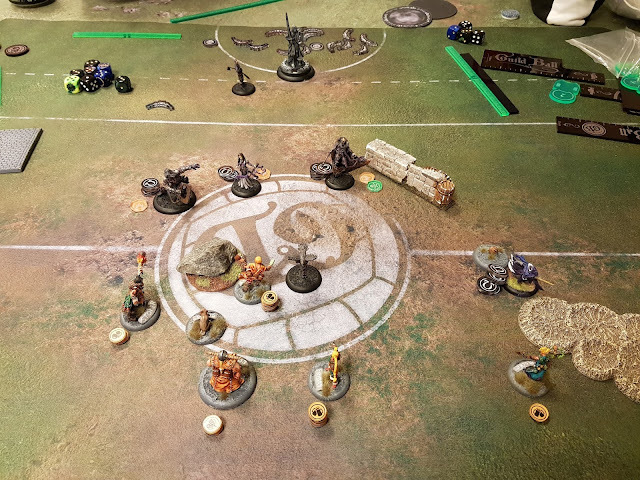 Grange takes 5 damage, Harrow 10 damage, and a couple on Windle. Poison and fire everywhere. Not good, I am starting to feel nervous! Grange gets 5 influence, Jackstraw 3, Bushel 2 for a possible run + kick, Windle 2 for dealing the pain, Harrow 1 for Tooled Up, Peck 1 for Cocky. Both the captains gets ganged upon and go down like twin sacks of flour. I need to unentangle Bushel and get her up to score. 1 influence to pass to Jackstraw, and then teamwork dodge 4" to get free. 2 influence use "I'm open" on Jackstraw to get the ball back! 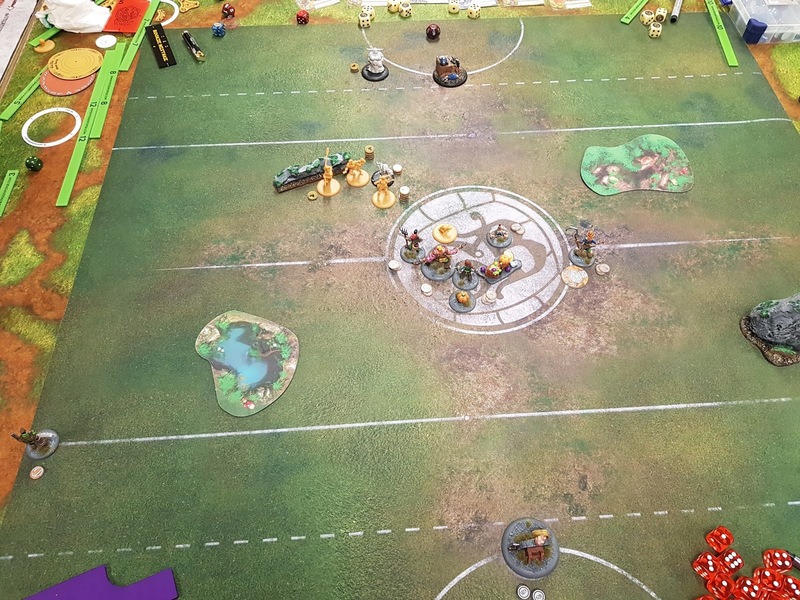 Jog to within 4" of goal. 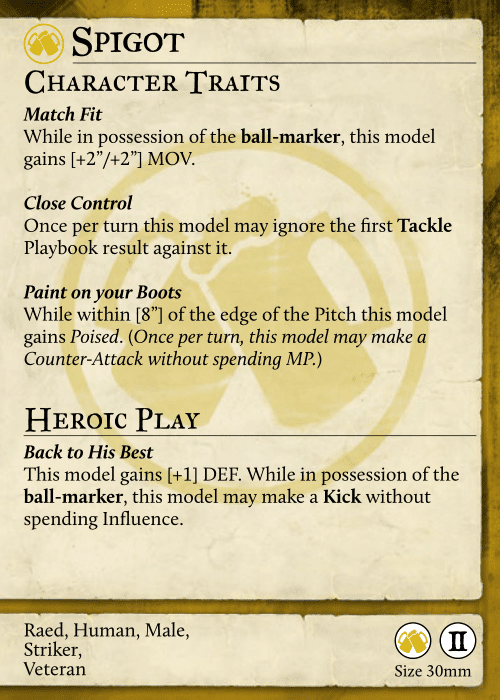 1 influence to kick and score! I left a harvest marker from the last turn. 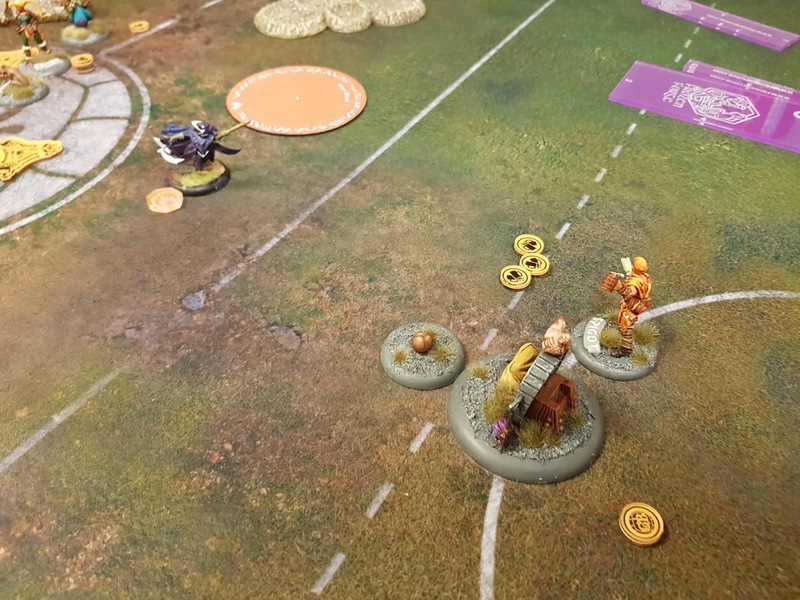 Harrow gives tooled up to Windle, who wolfs down a sandwich and goes to town! In one single activation he does 6 attacks and finishes off Spigot, Stoker, and Friday! Waaaaagh! Wait, wrong game. Windle smash! 12-2 to the Farmers. 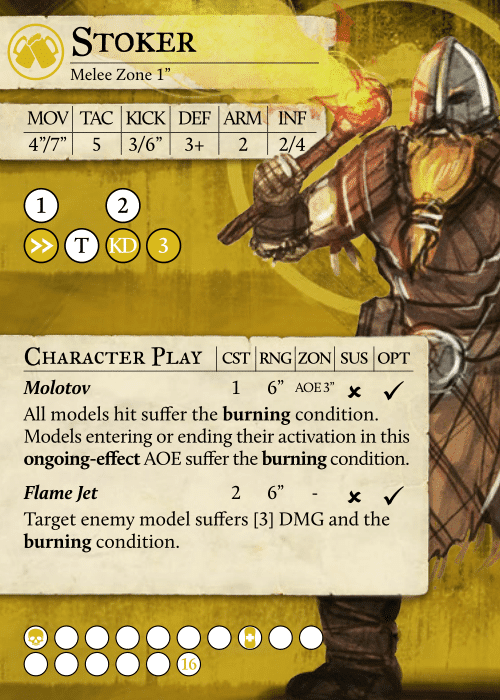 The first turn against Esters is rough, but later in the game I feel that Tapper is stronger with his Commanding Aura and effective +2 influence. I keep forgetting that it is possible to use Momentum to ignore rough terrain. I really must start remembering that.